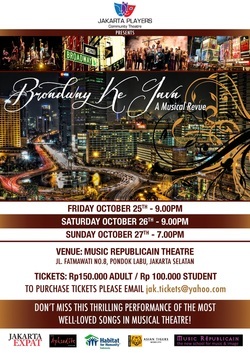 Tickets are on sale for the Jakarta Players' newest production, "Broadway Ke Java: A Musical Revue!" Broadway may have its roots in the quintessential iconography of the legendary New York City, but the charm, excitement, and artistry of Broadway cannot be contained to one town. As Broadway shows have merged with Hollywood and touring companies spread the wonder of musical theater to new locations around the globe, the glamour of Broadway has swept the world and now it is here in Java, ready to work its magic on Indonesia. Join Michael J. Donovan, a passionate Broadway connoisseur, as his attempts to educate his audience about the classic, artistic beauty of musical theater constantly come under fire from Keith, a down-home American guy who thinks Broadway is much more “down and dirty.” The two men heatedly argue their respective sides, using beloved Broadway songs to prove their points. Yet as the beautiful, exciting, hilarious, and tear-jerking music of Miss Saigon, Chicago, Les Miserables, and Avenue Q wash across the stage both men come to terms, realizing that Broadway has it all, a little something for everyone. Whether you are from Broadway or Java, the music and dance of Broadway will win your heart forever. Seating is limited and tickets are going fast, so get yours today! Please see the attached flyer for ticket details. Please note, there is some language and sexual content; please use discretion for children under thirteen.